My name is Martin and I have cancer. 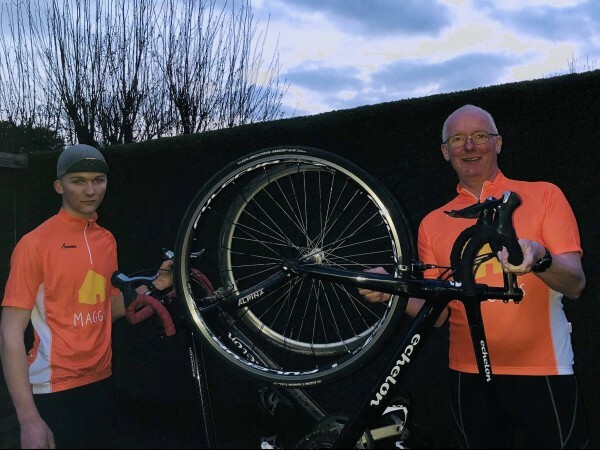 From the 16th - 19th May, I am going to cycle unsupported with my son from Paris to Cheltenham, raising funds for Maggie’s. It was December 2017 that I was diagnosed with Metastatic Colon Cancer. My cancer is stage IV and my treatment is chemotherapy, every two weeks for the rest of my life. There are tough times during my chemotherapy treatment and the side effects of the drugs require continuous management. Some days are harder than others. Before my cancer diagnosis at 50, I had lived a healthy and active lifestyle. So with that in mind, I have decided to cycle unsupported from Paris to Cheltenham. Along with my son, Kieran (aged 16), we’ll take on this unique challenge together. A father and son adventure. Pushing ourselves over a distance of approx 500km, I want to show him, our family, our friends and anyone else who’ll listen, that getting cancer is not a reason to stop. Training for this ride is difficult. Scheduling it in between my on-going chemotherapy cycles and fatigue/energy levels that the treatment puts upon me can be hard and often hurts. But continuing to be active and maintain a healthy fitness level, helps with my mental and physical attitude. It keeps me living my life as normal as possible. I decided to raise funds for Maggie’s because they are a fabulous local cancer centre that provide free practical, emotional and social support, for all cancer patients, families and friends associated with any aspect of cancer. Thank you for taking the time to read my post and for your generous donations. If you require any further information please don’t hesitate to contact me. I also want to take this opportunity to say how grateful I am to all the staff at Warwick and Stratford-upon-Avon Hospitals who continue to provide me with excellent treatment. Thank you.